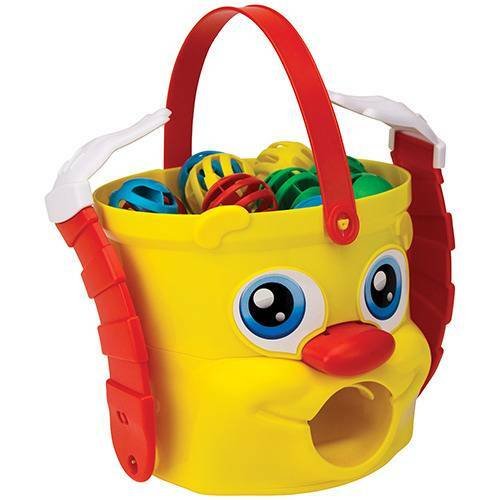 Get ready for buckets of fun with Mr. Bucket! The nostalgic favorite has come back to entertain a whole new generation of kids. Scoop up the balls that match your colored shovel, and drop the balls into Mr. Bucket as he whirls and spins around the floor. Watch out - Mr. Bucket will try to block your ball with his hands and will even spit the balls right back out of his mouth onto the floor, creating tons of laughter and fun! Get all three of your colored balls inside Mr. Bucket first to win! Made with high-quality materials, Mr. Bucket will have kids up and moving around.